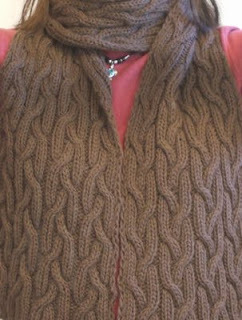 Here's a simple cable scarf that is perfect for guy or gal. I love how cables are unisex. :-) I'm not kidding when I say this scarf is easy. It's mostly K2 P2 ribbing. I only did 224 total cable crossings for this scarf. Compared with 1,255 cable crossings in my Persephone Scarf and 1,702 cable crossings in my Ariel Scarf, this Miranda Scarf is a cinch. Once established, the pattern is also very easy to memorize, so it becomes mindless knitting. 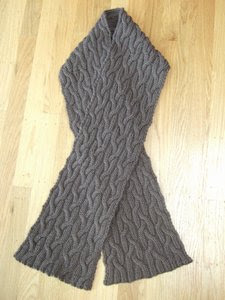 When I designed this scarf, I decided that I did not want any border (like the seed stitch border used in my other two cable scarves) to detract from the pattern. I used 5 balls of Cleckheaton Country 8 Ply superwash wool (105 yds per 1.75 oz ball) which gave a finished scarf of 58 inches long and 6 inches wide (147 cm x 15 cm) unblocked, 66 inches long and 9.5 inches wide after blocking (168 cm x 24 cm). 6/4/07: Correction made to pattern to include definition of "Slip 1" in the Notes Section. This is lovely! It makes me think of a puzzle, or a labyrinth. That's a very pretty scarf, Marie. Thanks for writing the pattern up! Marie, another beautiful scarf! They are jsut my style. Thanks for the pattern! I love it - looks fabulous. I'm going to have to print this pattern! Also do you have the pattern for the Utopia Hat? Where can I find that? Thanks so much for sharing all your wonderful patterns with us. Your scarves are beautiful! Are they named after the planets in Firefly and Serenity? This is lovely, thank you! I haven't been knitting for some time either and this might just get my mojo back - hope yours has found its way back home to you too! i love this scarf. 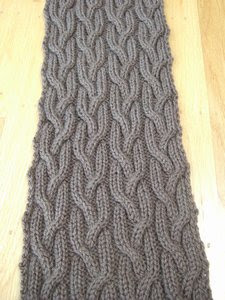 i have to admit serendipity upon finding this pattern- i have vannas glamour yarn in a very similar grey and i didnt know what to do! perfect!